Planning for next year's festive campaign starts months before the current campaign has finished, Marks & Spencer's head of Christmas revealed at Brand Film Festival yesterday (5 April). 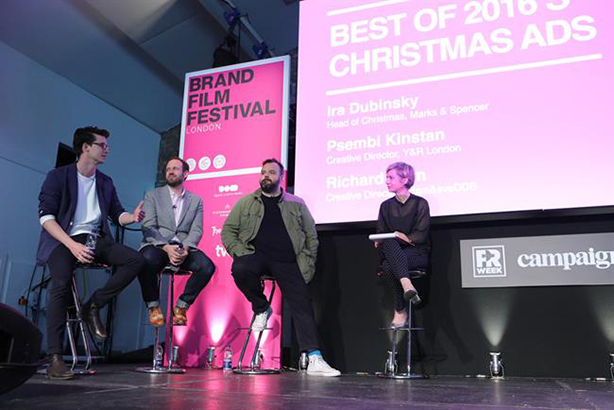 An audience at the inaugural Brand Film Festival London got a glimpse of how seriously M&S takes Christmas, given that it employs marketer Ira Dubinsky as a head of international marketing and Christmas and started planning its last festive campaign 15 months in advance. "We started sort of September or October the year ahead," said Dubinsky of their 2016 Christmas campaign, "Christmas with Love" which depicted Mrs Claus taking a helicopter ride to London to deliver a special gift. The reason for the long lead time (most other major brands start planning Christmas around January), is to allow time to work with product developers and designers, he explained. Mrs Claus was also special for M&S because the ad was a departure from the brand's traditional Christmas ad campaigns. "Christmas is such a critical time for retailers, and it's crucial they connect with customers. Our previous ads, we've done it in an M&S way, celebrities, product front-and-centre, glamorous and flashy. It wasn't connecting the way we wanted to." So a decision was made to make the ad more heartfelt and more about the M&S customer. "We ended up thinking about women. The heart of the household, of Christmas, delivering gifts and inspiration," Dubinksy said. For most brands the ideas take months to develop. In the case of Mrs Claus, the idea was there early on but it took four months to really develop the story, said Psembi Kinstan, creative director of Y&R London and a creative who worked on Mrs Claus. The ad was one fo the last Y&R created for M&S because in August 2016 the brand moved its creative account to Grey London. Speaking from an agency side, Richard Brim, creative director of Adam & Eve/DDB (the agency behind John Lewis' "Buster the Boxer"), Christmas ads can be quite the onslaught. Brim said: "We did about eight last year. It's all year, then you deliver the ads in November, have a brief respite over a Christmas you just don't want to hear about anymore. Then on 3 January you return to work with an awful knot in your tummy." Because the planning is done so far ahead, brands and agencies take a certain amount of risk by trying to predict the future. One way of offsetting the risk is to remember that the ad is there to sell the story, and the story can be timeless," Brim said. "However, 'Man on the moon' [John Lewis' 2015 Christmas ad] was a bit of a risk as it could have been too sad. I think if we had used it in 2016 when there was so much stuff going on that could go wrong – which it did – it would have been too sad," he added. The risk for a retailer like M&S, with products thrown into the mix, is even higher. But Dubinksy has faith in his brand's experts: "We have whole teams, lots of people, involved in identifying trends and how to tap into the zeitgeist and be relevant to customers. There's always risk, but great retailers and businesses take risk and are also agile enough to flex along the way." Revealed: who won at PRWeek and Campaign's Brand Film Festival London?